Have you ever thought about how many things you can do with a deck of playing cards. There are tons of different games you can play. But, that’s not all. They’re also a great tool for practicing different math concepts. So, grab a pack and let’s explore comparing numbers using these fun greater than less than games. 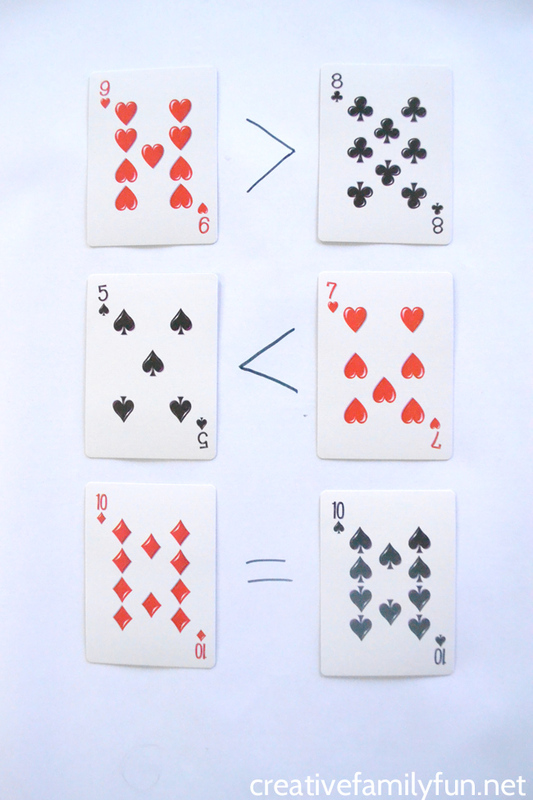 If you don’t already have a deck of playing cards at home, pick up a deck to have on hand for fun math games. For the following activities, you’ll want to pull out all the kings, queens, jacks, and jokers leaving all the number cards. Give the deck a shuffle or two to mix it up. Now, it’s time to have some fun and learn too. 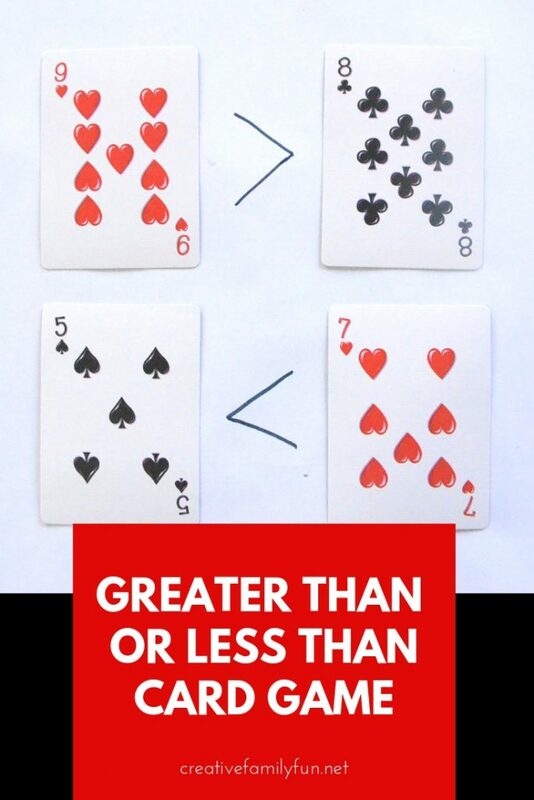 Here are some ways you can use the cards to practice greater than and less than. Divide the deck of cards in half. Turn over the top card of each pile. Decide which number is greater than the other number. Make a pile of the larger numbered cards. Keep turning over cards until you reach the end of the piles. Alternatively, you can focus on the card that is less than. Make a pile of the smaller numbered cards instead. Lay out two cards side by side on a sheet of paper, chalkboard, or small white board. 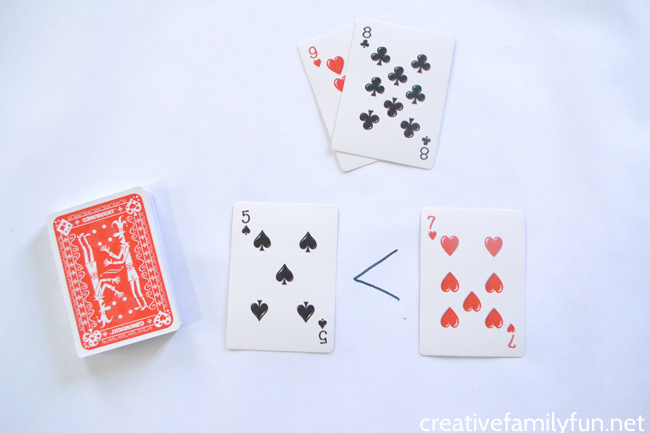 Write the correct greater than or less than symbol between the two cards. Divide the deck of cards between all the players. Have each player turn over the top card of their pile. The person with the largest number keeps their card and the rest of the players discard their cards. Keep going until the piles are depleted. Whoever has the most cards at the end is the winner. Alternatively, have the person with the smallest number keep their card. Have each player take turns flipping over two cards and then say the correct number sentence using greater than and less than. For example in the example above they would say, “five is less than seven.” Keep taking turn until the entire deck has been used. 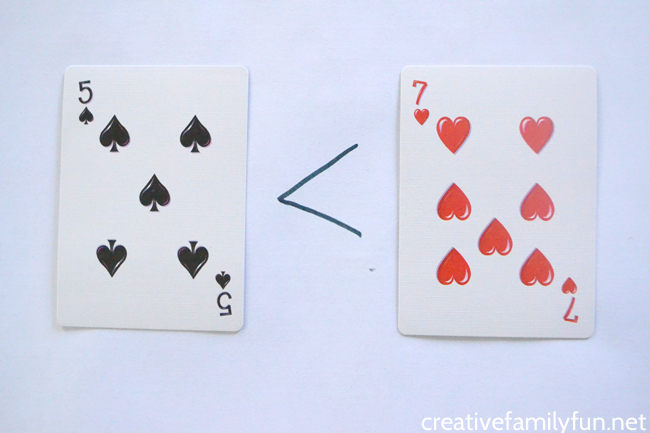 Can you think of some other fun ways to practice greater than or less than with playing cards? In addition to a pack of playing cards, there are some other items you can keep at home to help your kids practice math. Here are some options I would recommend. If you were to write a story about St. Patrick’s Day, what would you write about? 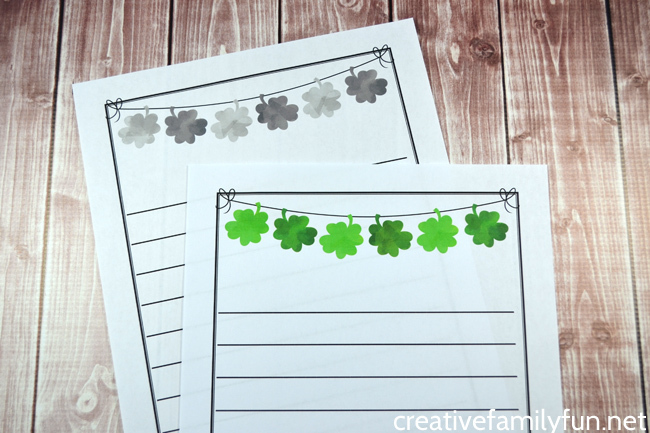 No matter what your idea is, you’ll need some great Shamrock Writing Paper to write it on. If you don’t already have a great idea for a story, here are some fun writing prompts to get you started. But, you don’t have to just write a story. 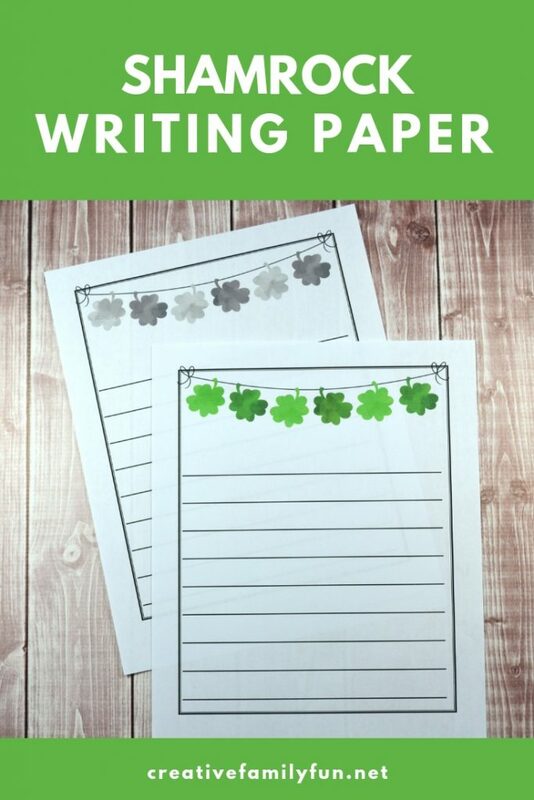 You can use this paper to make a list of things that are green, facts about Ireland, or a report about the history of St. Patrick’s Day. You can even use it for a spelling test! 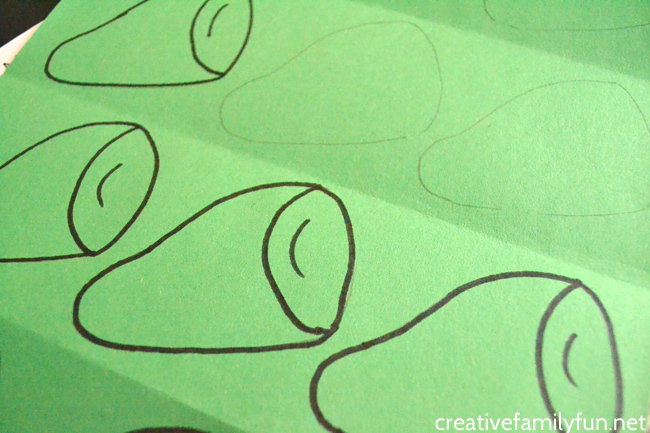 It’s so easy to get a copy of this fun shamrock writing paper. Follow the links below, save to your computer, and print as needed. I’ve provided two different copies for your convenience. The first link is full color and the second link is in black and white. Print your full color writing paper here. Print your black and white writing paper here. 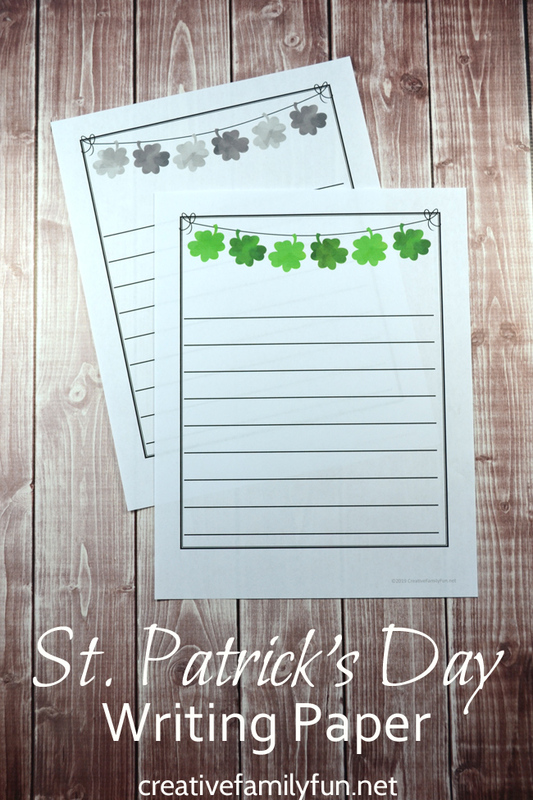 Please note: This printable shamrock writing paper is for home or classroom use only. Selling or using this paper as part of a paid product is prohibited. Get inspired with a fun St. Patrick’s Day book! Inspire your young writers with one of these fun St. Patrick’s Day books. Did you ever want to travel to the end of the rainbow so that you could find the pot of gold? It’s fun to imagine, isn’t it? 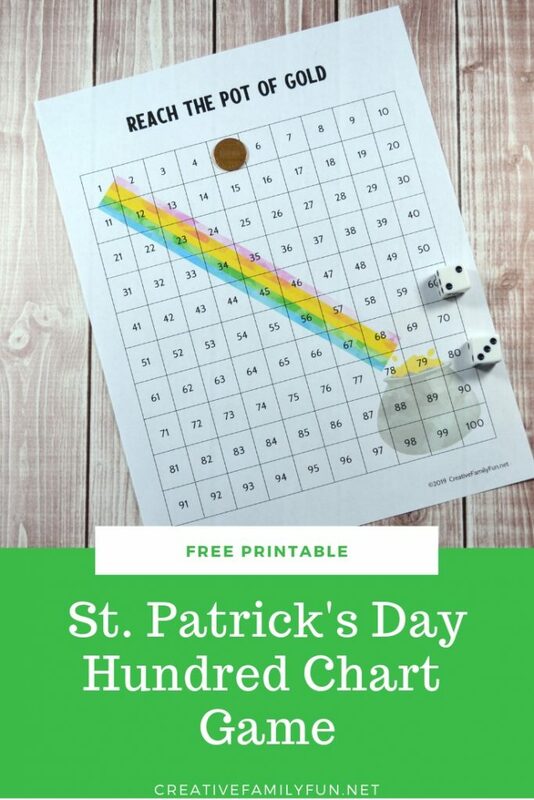 With this fun St. Patrick’s Day Hundred Chart Game, you can do just that. We’re going to roll some dice and do some addition to reach the pot of gold. 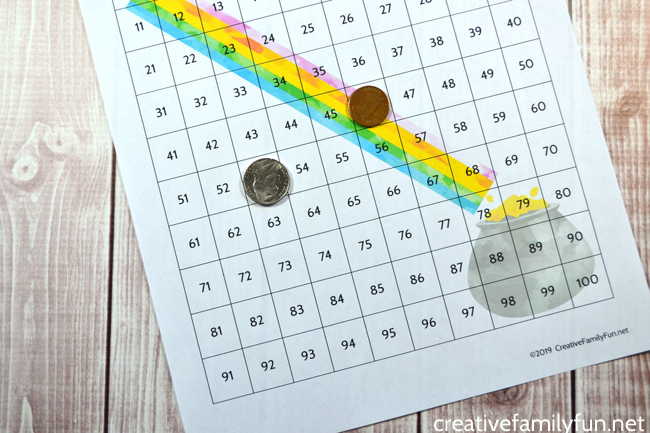 After you’re done with this fun game, you can continue learning with hundred charts with all these fun Hundred Chart Activities to Make Math Fun. You’ll need a few supplies for this fun game. 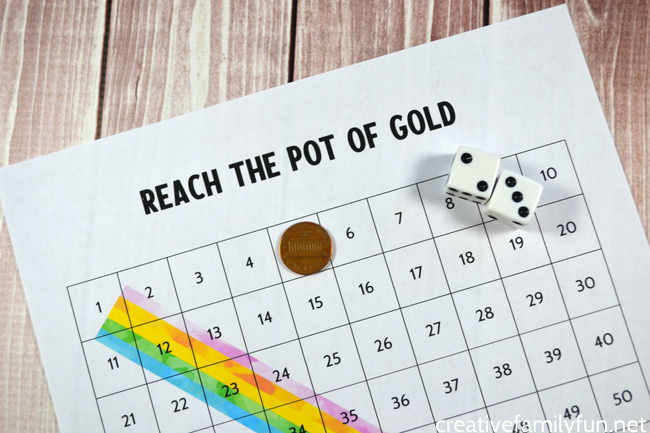 First, you’ll need to print a copy of your Pot of Gold Hundred Chart. You can find it at the link below. 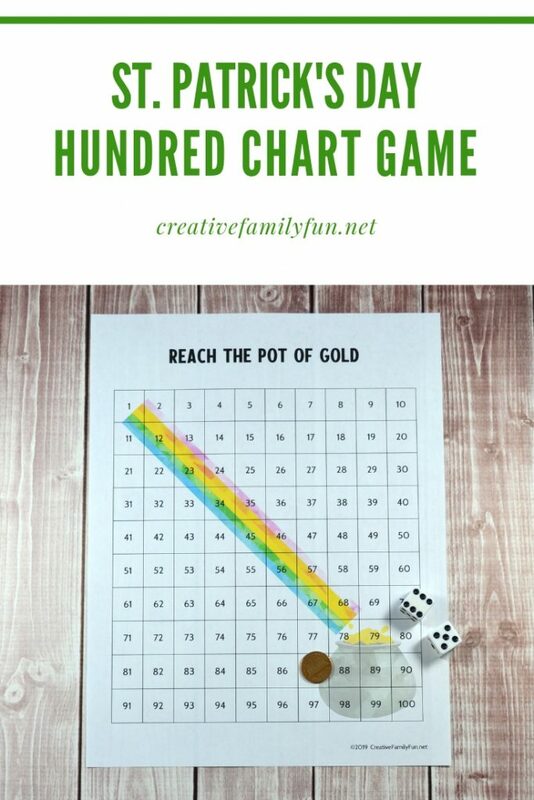 Click here to get your Pot of Gold Hundred Chart. If you plan on using this often (or in the classroom setting), laminate your hundred chart for durability. Finally, you’ll need 1 or 2 dice and some game pieces. We just used coins, but you can use anything. Gold coins or St. Patrick’s Day mini erasers would also be fun. You can play either a one person game or a two person game. The directions are below. Start with your game piece on the number 1 square. Roll the dice and move the number or spaces indicated. Encourage your child to use their addition skills to add the two dice together and also add that number to the square they are on to find out which square they should move to. Keep playing until you reach 100. You’ve found the pot of gold! The two person game is very similar to the one person game. Except you’ll be racing each other to see who gets to the pot of gold first. For this version, use two different game pieces. We were using coins, so we used a penny and a nickle. Play the game the same as the one person version except have the two players take turns throwing the dice and moving. The first person to reach the the pot of gold at the end of the rainbow in square 100 wins. 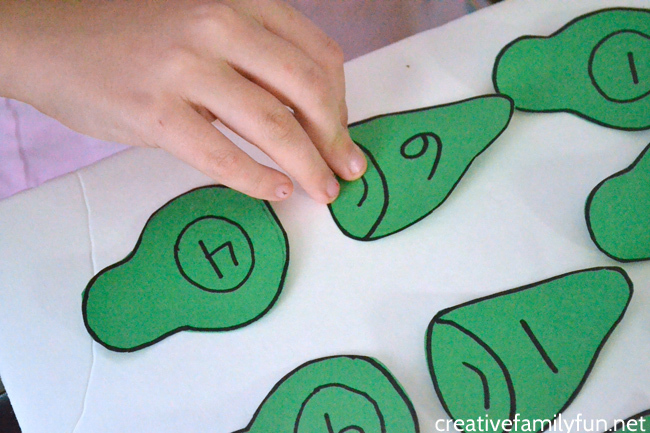 Are you ready to play this fun St. Patrick’s Day hundred chart game? Do you want to do more fun family activities? We’ve got a few books at our house that have the tatters that only a well-loved book can get. Green Eggs and Ham is one of those books. 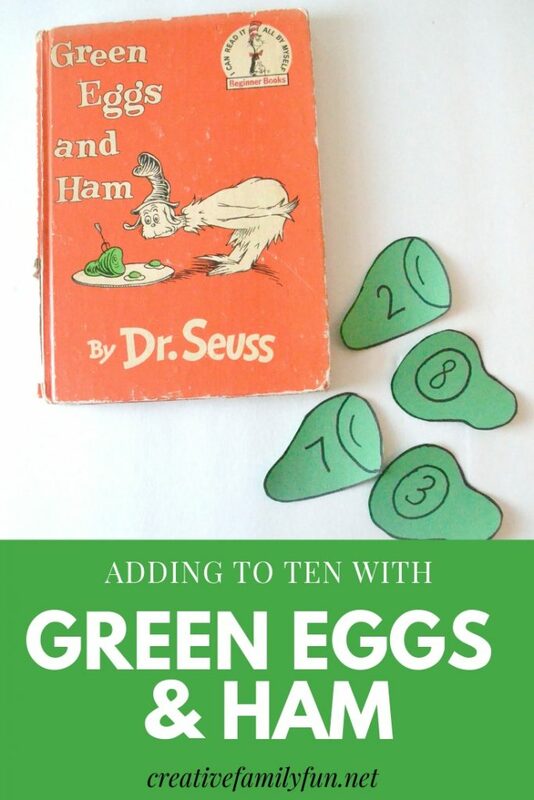 We always have great fun reading it and even more fun doing activities inspired by the book, like this Green Eggs and Ham addition match activity to work on math facts. This game was very easy and didn’t take too much time to make. Involve the kids and have them help put it together. Working together makes it go quicker! Take each piece of paper and fold it in half. Fold in half again so that you have a simple accordion fold with four sections. This will help with the size for your ham and eggs. You’ll want 11 ham shapes on one piece of paper and 11 egg shapes on the other piece of paper. So, you’ll have 3 shapes on each folded section of paper. 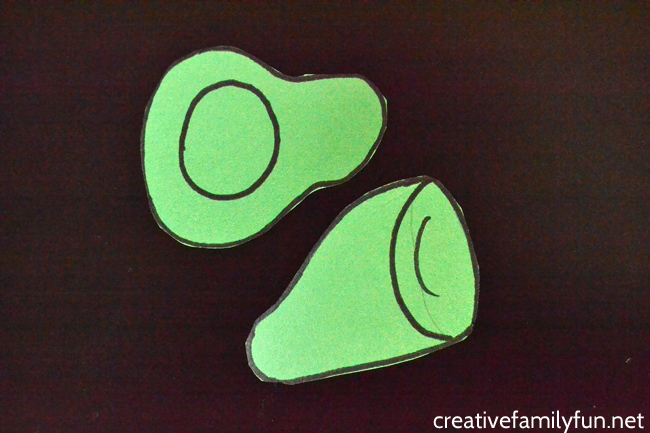 Draw simple ham and egg shapes inspired by the book. To make this easier, I drew one ham shape, and cut it out. Then, I traced it ten more times. I did the same for the egg shape. As you can see in the picture above, I made super-simple shapes. There’s no need to make it complicated. Trace each shape with your black marker and then cut out all the shapes. Recruit the kids for this step. They’ll love to help! Once you have all the shapes cut out. 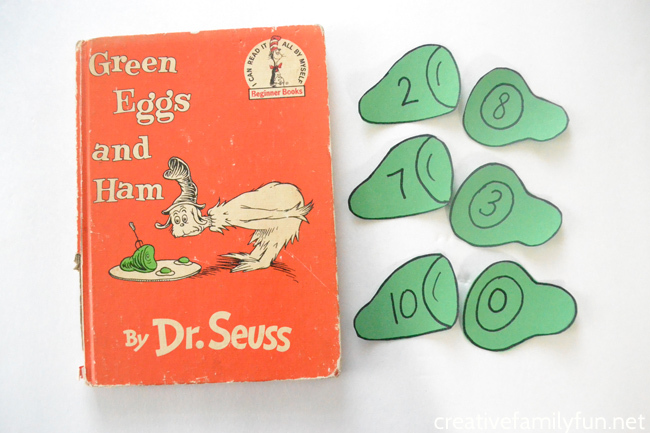 Write the number 0 – 10 on the egg shapes and again on the ham shapes. The game is ready to play. It’s time to have fun making 10. Spread out the egg and ham pieces. Match one egg and one ham so that when you add the two numbers together, you’ll get 10. Two-player version: Turn all the pieces face down and play like a memory game. But, instead of matching the two numbers, you’ll want to turn over two number that equal 10. 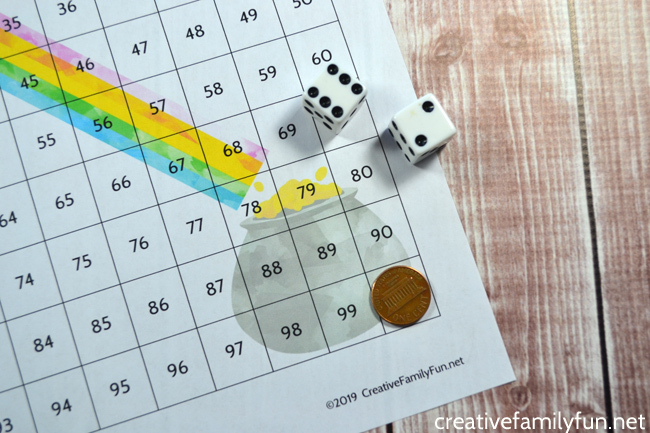 This fun math game is perfect to pair with a good book. 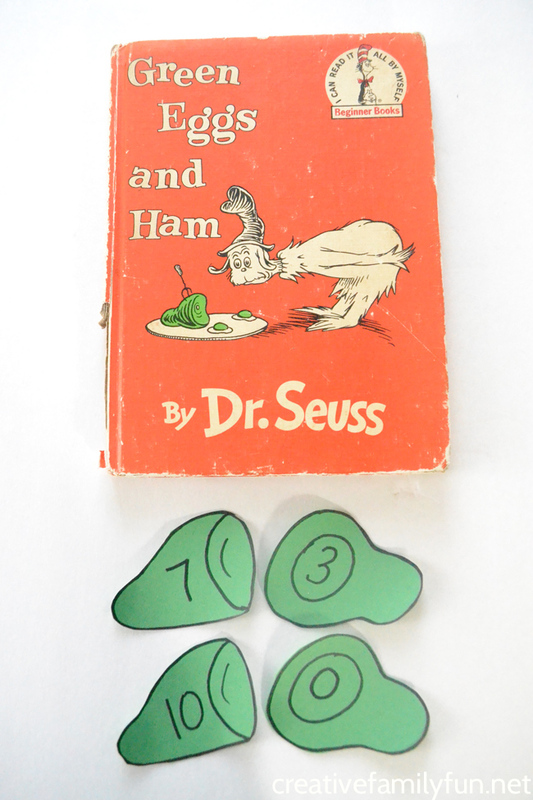 Grab a copy of Green Eggs and Ham and one of these other fun Dr. Seuss books. Do more activities with your family! 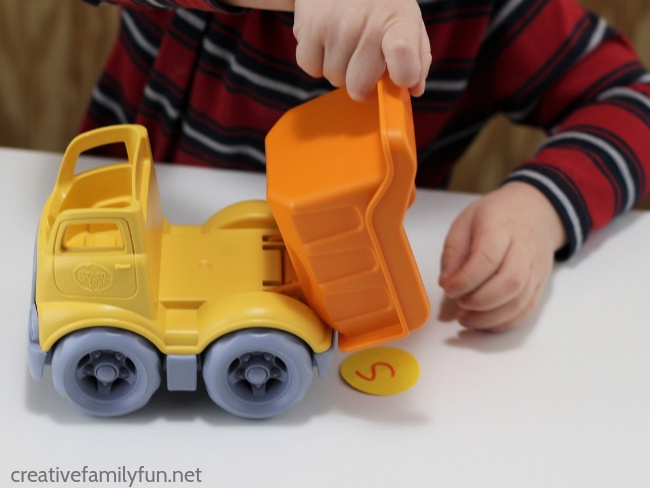 Does your toddler love trucks? 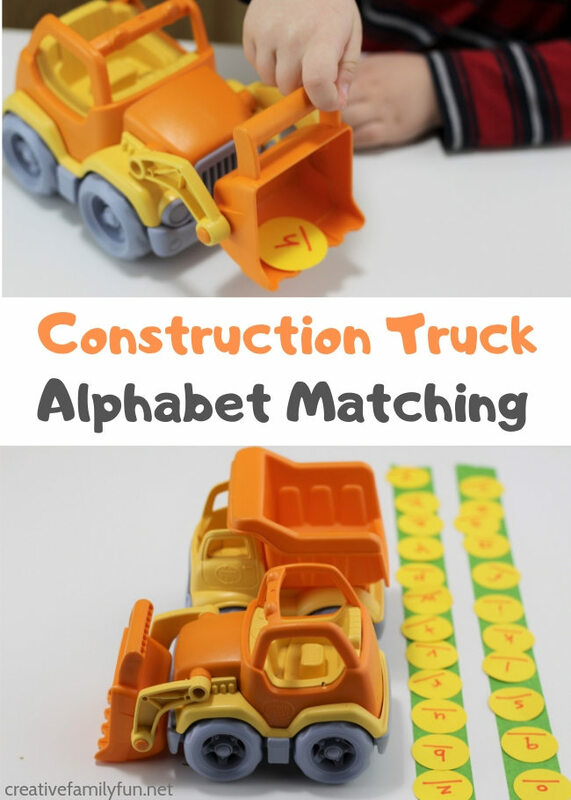 Build on that interest and practice learning letters with this Construction Truck Alphabet Matching Activity for Toddlers. 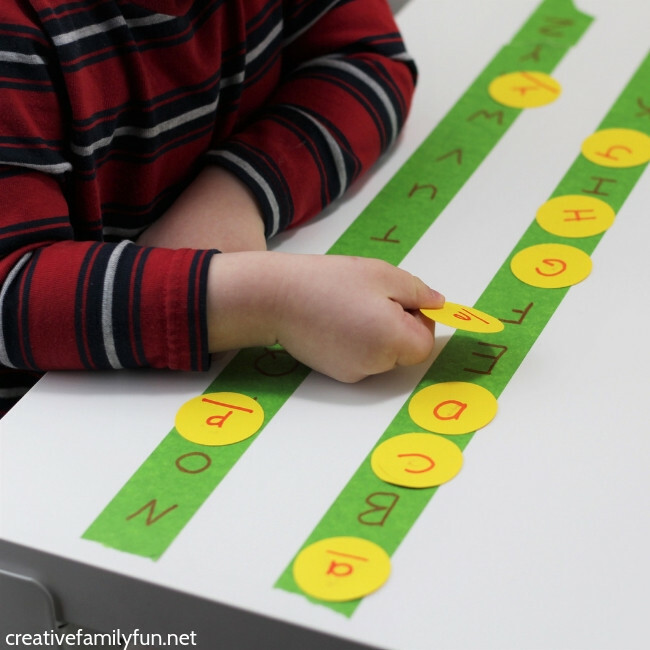 With this activity, we’ll work on letter recognition, letter sounds, and differentiating between upper case and lower case letters. Next, you need a starting place and a landing area for the letters. I used painter’s tape to mark these areas. Double check your surface before using tape on it. Short term is usually fine for painter’s tape. If you leave it on too long (like overnight), it can damage your surface. Instead of tape, you can use a piece of paper or a tray. Write capital letters on the tape or paper at your landing area. Place all of your paper letters on the starting lines. I had the lower case letters facing up. The goal is to match the lower case letters with the capital letters written at the landing area. Encourage your child to choose a paper circle. What letter do you see? Ask your child to say the name of the letter. (You can also work on letter sounds.) If she doesn’t know the name of the lower case letter, have her turn the circle over and look at the upper case letter. Does she know the name of the letter now? Have a construction truck carry the letter to the landing area. You could also point to the capital letters and have your child say the name of each one until you get the matching letter. Place the paper circle on top of the correct capital letter. 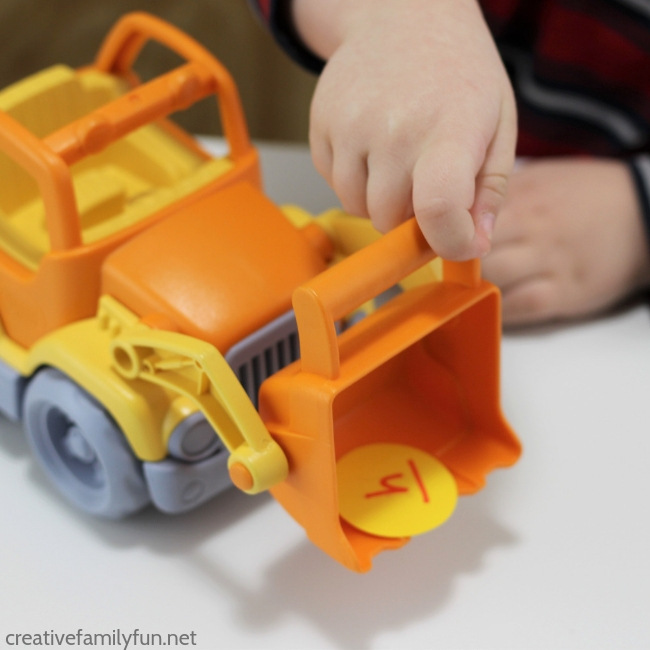 Take your construction truck back to the start and get another letter. 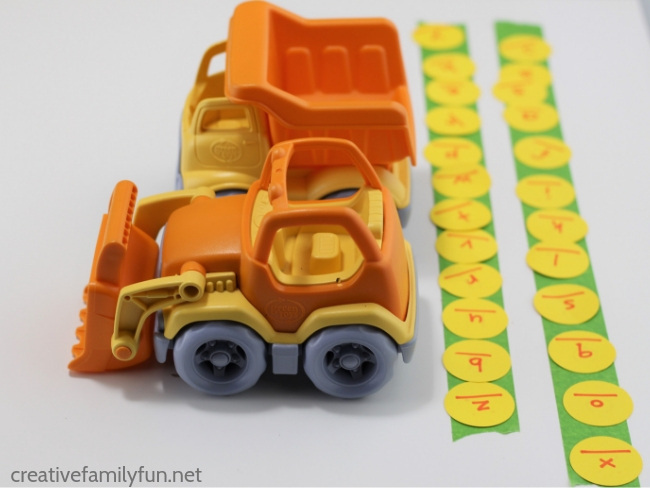 My toddler loved playing this construction truck alphabet matching game. 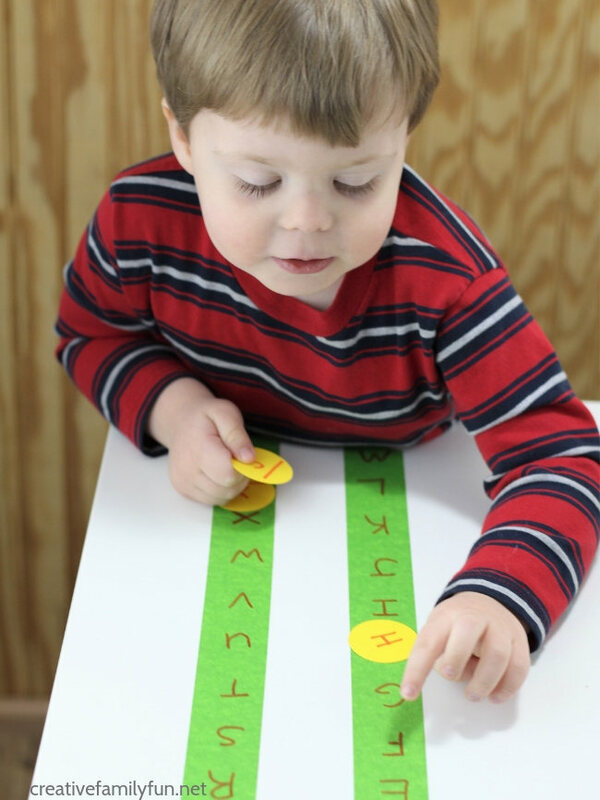 It was a great way for me to realize what letters he already knows and which ones he could use more practice with. Once we had done all 26 letters, he wanted to play again. And so we did. 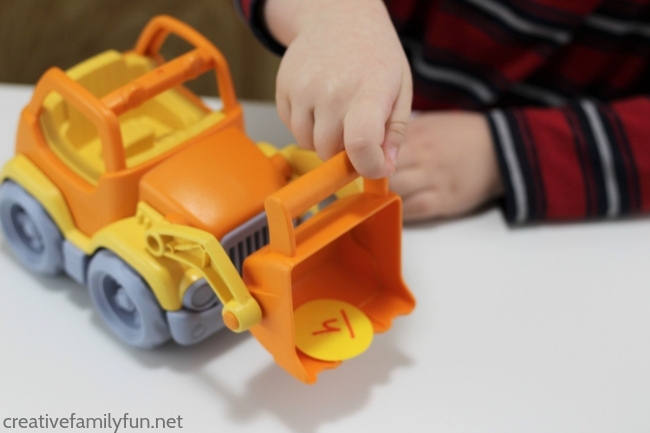 Snowball Toss Alphabet Game – Practice letter recognition and letter sounds with a pretend snowball fight. 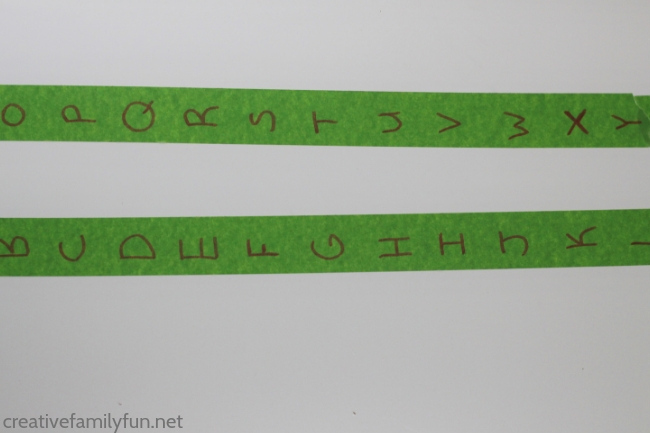 Alphabet Jumping Games – Pretend to be frog and get jumping from letter to letter. Driveway ABC Game – Head outside with some chalk to play this outdoor alphabet game.